At least once a week, after she’s packed the 7- and 8-year old off to school and the 3-year old is still sleeping, Marion goes to her computer and opens WordPress and shares something from the previous week with the entire world. That world, according to statistics, consists of 15-20 people per post; at least six of which are relatives and another half dozen are friends; all of whom get a notification on Facebook that she’s written something new. Of course, she has more Facebook friends than that, but apparently many aren’t interested enough to click through. She’s glad she doesn’t know who’s who. The other 3-7 people daily? Could be anyone who is anywhere on the globe. She’s had some interesting comments, including recurring ones from someone who, after tracing the IP address, is somewhere in Idaho. She feels like she’s getting to know this person better than the so-called FB “friends” who can’t be bothered to tune in when she posts her thoughts. My wife and I have discussed this before with respect to worship leading. Attending a church of hundreds, we noticed that very few aspired to standing up before the entire assembly and open their mouths and start singing. Many would be embarrassed to be up there doing anything, others would simply be frozen at the ‘what do I wear?’ stage. But both her and I do this as second nature. Not only singing, but choosing the songs and preparing the congregation for some of them with a verbal introduction, or what is traditionally termed a Call to Worship. At least once someone suggested to me that people aren’t clamoring to replace us, which got me thinking about many different aspects of our particular area of local church service. Do we look a little strange doing this? Aren’t most people afraid of public speaking? Could we just get on with the sermon? Should I pay more attention to what I should wear? 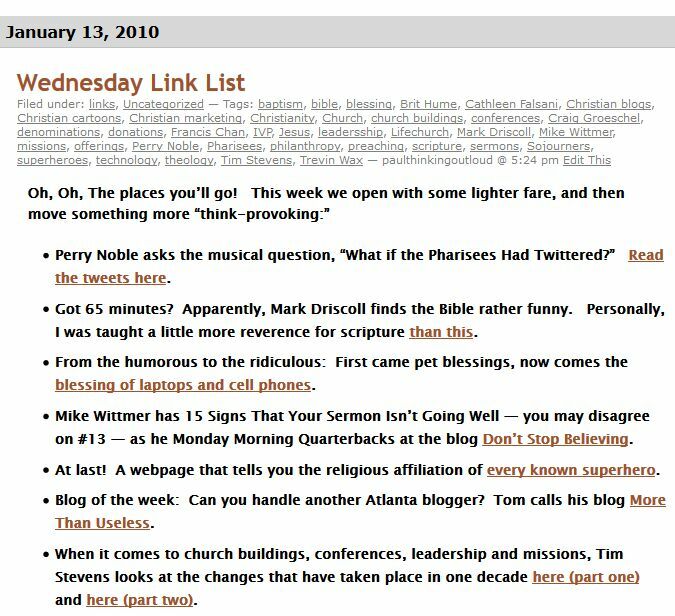 As I’ve mentioned before, the WLL has something in common with other things I have done, such as, a long time ago, hosting a Christian radio program. For me, that was all about choosing the songs. It’s based in a desire to want to share musicians and songs with people for the first time that they will then want to have playing in their home or vehicle or workplace on a regular basis. One day we started a bookstore in just a few hours. We drove to a town we’d only been through once or twice before, met with a local pastor, viewed a location, checked out two or three other options, drove back to the first one, picked up a copy of the lease, arranged to purchase the fixtures of an adjacent store which was closing, called the utilities to arrange for power and phone service… and then we looked at the clock. It was lunchtime. We went to the food court of a local mall and walked around and considered the possibility that the day was young, and we could drive to another city and do it all over again before suppertime. We didn’t, but it would have made for a great story. Repeating the question, who does this? I guess we do. Space does not us today to consider the projects and initiatives my wife has begun. I don’t think either of us are particular Type A people. We’re not up at the crack of dawn. Our house looks like a robbery just took place. We habitually procrastinate. There is a similar temperament; at least we get each other. Probably many other bloggers do the link/roundup thing. They’re not all like Marion, the Mommy Blogger. At the heart of putting your writing out there in a public forum is the idea of sharing, be it your own opinions, or links to others who have good ideals or analysis. I started thinking how I could frame my week in such a way as to render all the individual tasks and goals flowing out of a desire to glorify God, rather than working for the things that would grant me happiness. His own doctrinal perspective surfaces when he states, “this belief is based on Arminian assumption” but he does come close — without actually using these words — to the idea that a balance is to be found between the activity of a Martha and the sitting at the feet of Jesus of a Mary. The notion of life, liberty and happiness avoids both. Perhaps it’s no accident that Jerry Bridges’ most enduring work is titled The Pursuit of Holiness, not happiness. So instead of asking myself on Monday morning what will best drive my personal pursuit of happiness, I need to ask myself what will glorify God and cause my mind to dwell in all his attributes and delight in him? At the end of the day, each of us must answer individually for how we’ve used our time, talents and resources. …continue reading more at Wikipedia.